Governor Andrew M. Cuomo today announced that New York State will provide free Learn-to-Swim programs to 1,000 additional children this summer at State Parks across New York. Albany, NY - July 14, 2015 - Governor Andrew M. Cuomo today announced that New York State will provide free Learn-to-Swim programs to 1,000 additional children this summer at State Parks across New York. The program is offered through a partnership among the New York State Office of Parks, Recreation and Historic Preservation; the American Red Cross; the National Swimming Pool Foundation; the Northeast Spa and Pool Association Foundation and the New York State Department of Health. · Wildwood State Park, Suffolk County. Programs are free and pre-registration is required. For more information on locations, schedules and how to sign up, visit the Learn-to-Swim page. Enrollment for the Learn-to-Swim program for children is open at all participating New York State parks. Participants' parents are asked to sign up ahead of time as space is limited and expected to fill up quickly. Each swim program is 40 to 45 minutes in duration and participants who enroll in these lessons will receive a Red Cross Learn-to-Swim Achievement Booklet and a State Parks Learn-to-Swim kit that includes a knapsack, tee-shirt and water bottle at the conclusion of the program. Most programs are intended for children age 5-10, but this year’s schedule also includes programs for toddlers at two parks, and basic water safety presentations at three camping parks. The New York State Office of Parks, Recreation and Historic Preservation oversees 180 state parks and 35 historic sites, which are visited by 62 million people annually. A recent study found that New York State Parks generates $1.9 billion in economic activity annually and supports 20,000 jobs. For more information on any of these recreation areas, call 518-474-0456 or visit online, connect on Facebook, or follow on Twitter. 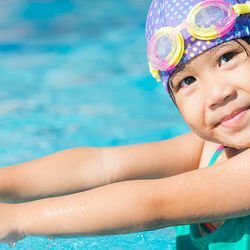 Subject: LongIsland.com - Your Name sent you Article details of "Governor Cuomo Announces Expanded Learn-to-Swim Programs to Serve An Additional 1,000 Children at State Parks This Summer"